The stage: A 3,000m high limestone mountain range – the jewel in the crown of the Austrian Alps. The performers: Forty (or more) adventurers of varying experience from all over the world, many of them students. This year the explorers are coming from America, Israel, Ireland, Wales, England, Canada, France, Germany, Austria, Romania, Norway, New Zealand, Bulgaria & Poland. The immediate prize: Formalising the connection between the 850m deep WUG Pot (Schmelzwasser Höhle to the locals) & the 1.1km deep/106km long Hirlatzhöhle, to realise the dream of half a century of exploration: a 1.5km deep super-system of more than 110km length. None of your easy multi-entrance systems here, this would be one entrance at 2000m altitude & the Hirlatz entrance at c. 700m altitude giving a 1.3km deep thru-trip that would be the envy of the French!! 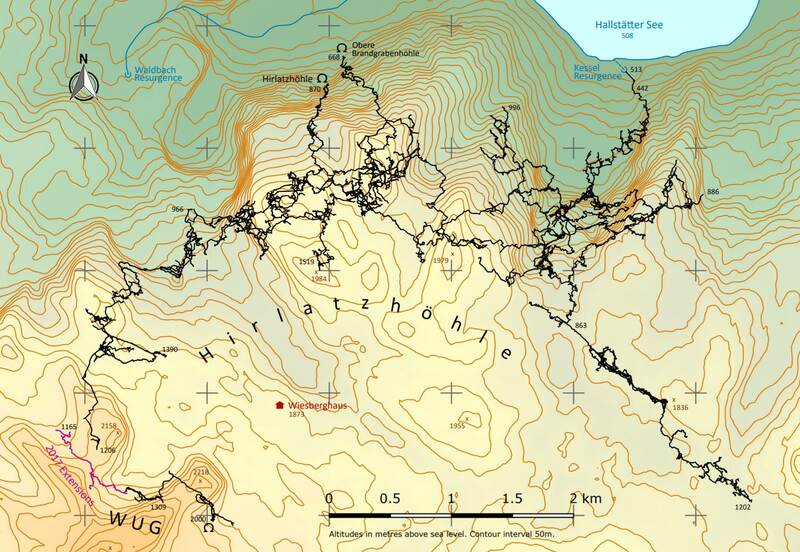 The additional prizes: Finding a dry connection between the sumped part of the Hirlatz (Wadiland/Sahara which is the lower part of WUG Pot) & the rest of the cave that would give access to the extensions from the Hirlatz itself, allowing winter explorations to take place; prospecting the mountains for new caves in key locations; pushing some of the discoveries made during the 2017 trip; training & motivating the explorers of the future. Last summer I went to the Dachstein to expand my caving horizons a bit. I’ve never been on Exped before, and this one seemed really welcoming, with a bit of something for everyone to do, regardless of experience. And my God: did it exceed expectations?! 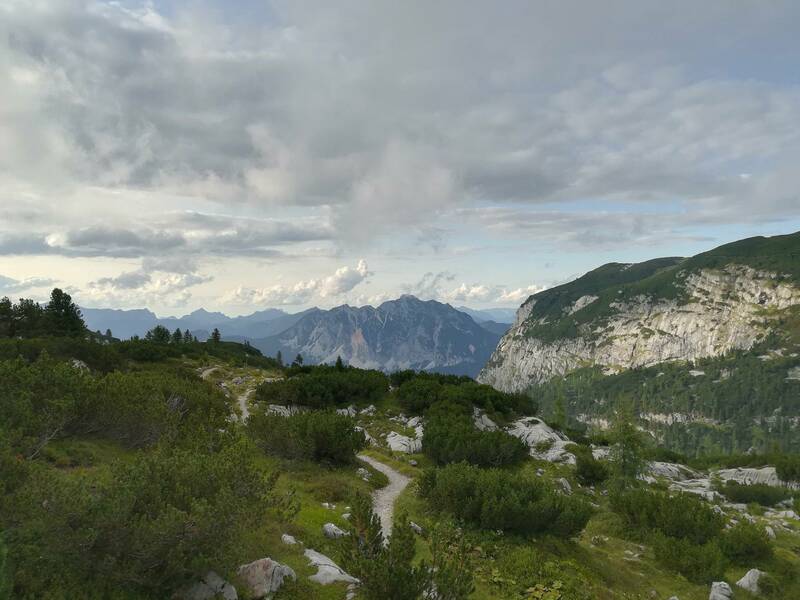 The Dachstein Massif is an amazing landscape; big dramatic mountains broken by steep valleys and glaciers, and nestled in-between is a caving wonderland. The exposed limestone is really broken and sharp, and you can see the cave potential everywhere! We stay right in the middle of it in an Alpine hut, the Wiesberghaus, which really feels like a cross between a pub and a youth hostel. There’s a fantastic team feeling in the group staying there, and every day you team up and head out to do something fun. The nearest cave is literally a stone’s throw away, and WUG is just a short walk up the hill. There is so much limestone up here, that new caves are all over the place & even after half a century of regular Expeditions we still haven’t scratched the surface. The “A-Team” (Alex, Alex, Andy, Angie, and I) found a new entrance that’s about 100m deep and still going, and I’m absolutely dying to get back and see where it goes! In order to make the dream a reality, the Expedition places a big emphasis on training and teamwork. To this end we’ve been running an Expedition Training Workshop each year for the last two decades and, prior to departure, we make sure that everyone involved has a minimum skillset, meets some of the other players, and learns a bit more about the project & what to expect. 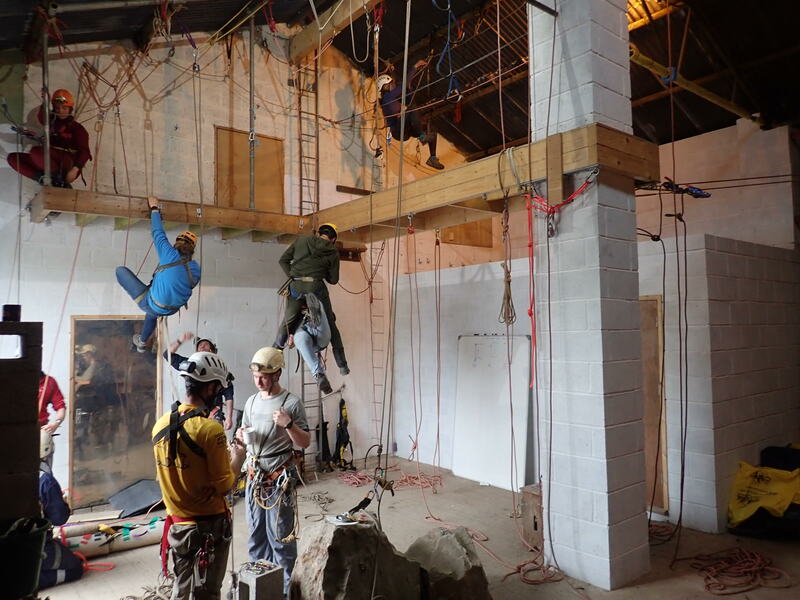 This time we were fortunate enough to be invited to use the fabulous facilities of the Gloucester Cave Rescue Group (GCRG) in the Forest of Dean, which is one of the best venues we’ve ever used. This is my first year getting involved with the Dachstein Exped, but I feel it's been a long time coming after hanging out with some of the regulars for so long! I decided to head over to the Forest to see what all the fuss was about. Even as of arriving Friday evening, I was impressed by the diligence of the trainers as I watched them set up the rigging and prep the site for the next day's activities (admittedly from afar, with a glass of wine). We started Saturday with a presentation given by Joel about previous Expeds and the upcoming goals of 2018. I was immediately drawn in by the tales of misery, as per usual, and whilst not wishing to glory-hunt the prospect of the connection becoming a reality sounded extremely tantalising. I was so drawn in, in fact, that I agreed to buy a Hirlatz book despite having minimal German language skill. 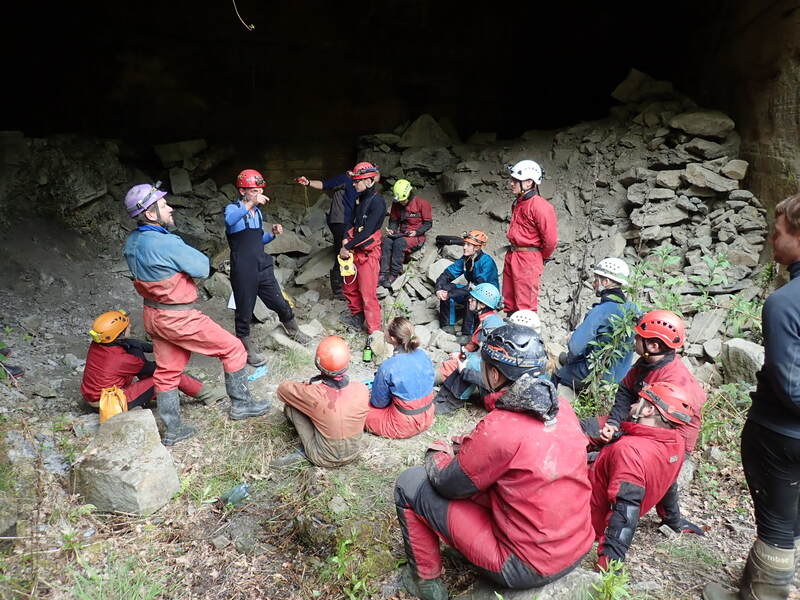 We proceeded to get stuck into the practical elements of the training weekend, first with a refresher on SRT and hauling skills, followed by a play in a local mine with digital and non-digital surveying methods. Having been on a couple of Expeds, it was nice to realise I hadn't completely forgotten everything! I also had plenty of new things to take away and think about, namely how to transfer from the fair-weather Expeds I'd become accustomed to, to the harsh environment waiting under the Dachstein. Unfortunately, I had to head off Sunday morning, meaning I couldn't take part in the group rescue practise. I've only heard good things about the way the exercise was handled, so it must have been a great way to wrap up the event! I'm looking forward to getting stuck in this summer with such an enthusiastic (and also suitably boozy) group. There was a fantastic turnout this year at the GCRG, with the number of attendees similar to that of the successful Dachstein Expedition last year. The numbers we had enabled a thorough alpine rescue training scenario on the Sunday. Joel & Matt were fantastic at ensuring everyone played a role and everyone had an opportunity to take a lead in the rescue practice. 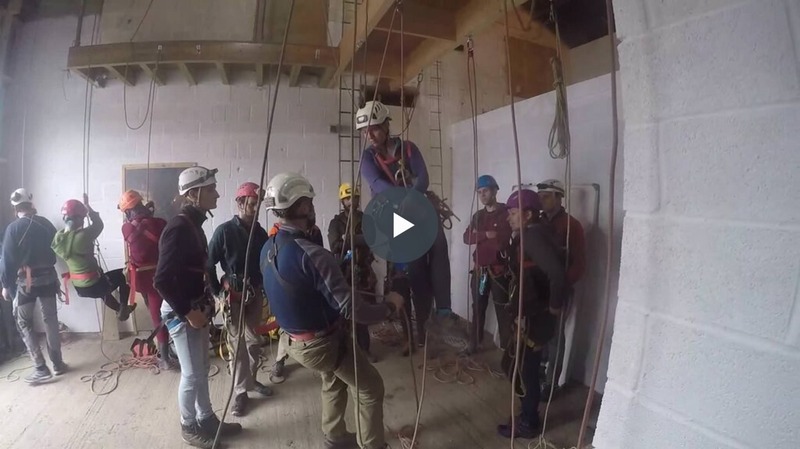 I went to the Dachstein last year, and found the rescue practice the year before absolutely invaluable. Training, teamwork, and coordination is so important, and this practice helps us learn the basic skills we might need to get a rescue underway abroad, before the locals take over. It also helps us understand what a rescue would really be like out on Expedition (and that we really don’t want to have one!). Prior to the training scenario, there was faffing consistent with common Dachstein “Faf” experienced on last years Expedition. Sarah, much to Joel’s surprise, volunteered to be our victim straight off the bat. Full of enthusiasm and curiosity, she was keen to experience life as a cave rescue victim, and sealed the deal when she chimed in "I can even capture it on my Gopro!”. I've not been to the Dachstein, or the training before, but I figured how hard can I be? As the proud owner of a GoPro, and being a fresh face in the group, I was volunteered as tribute to be the victim in need of rescuing. I learnt many things in the 5 hours I spent trapped in what can only be described as a modern-day answer to a straitjacket, mostly that I never want to be rescued ever again in my life. Used to subdue the naively enthusiastic and unsuspecting victims volunteers in the cave rescue world, this is no normal stretcher. Once strapped securely into my plastic sledge with what felt like a thousand straps, I was carried, hauled, shoved and contorted through the cave back to daylight and the prospect of safety. While I may have been fit and healthy going into the cave, the same cannot be said by the time I surfaced. Many a bruise was gained through the experience and 5 hours of immobilisation is enough to give anyone backache. 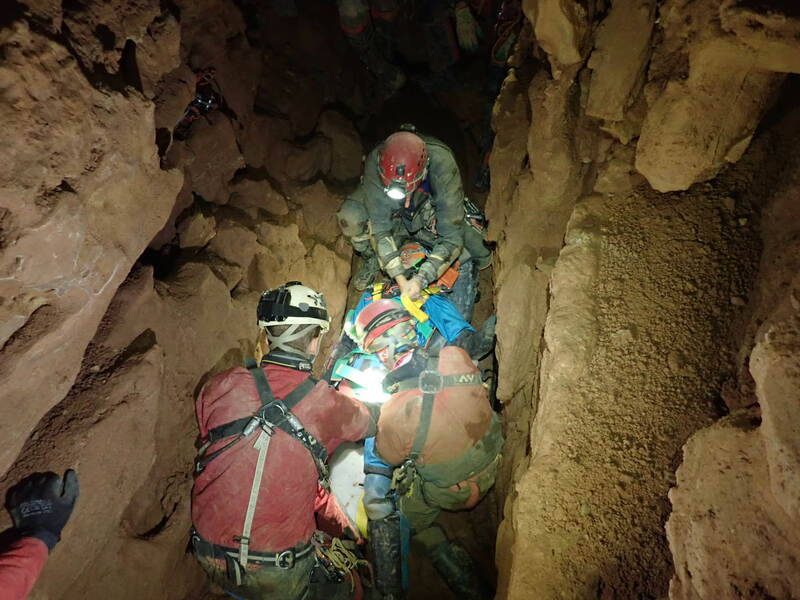 The sheer amount of coordination and equipment to get a person out of a cave was eye-opening. 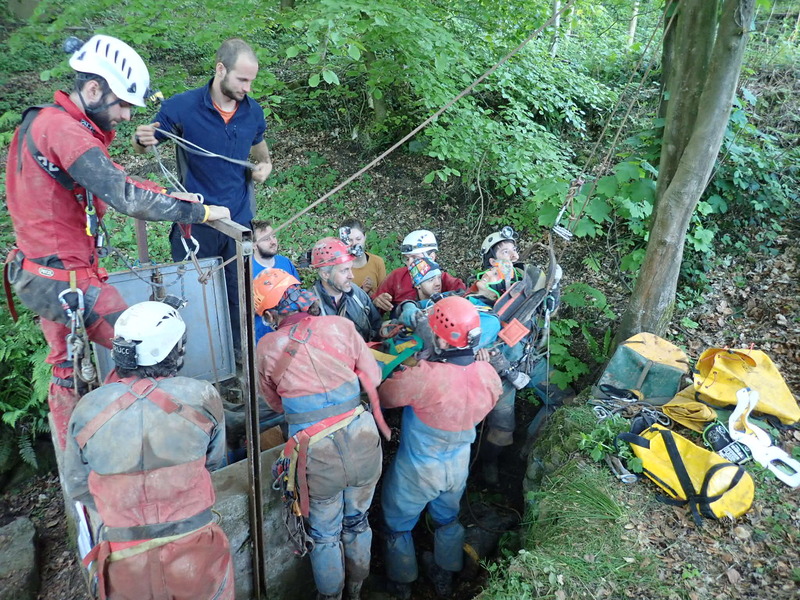 The group worked fantastically together and made a successful rescue, utilising everyone and everything they could get their hands on. The only thought that crossed my mind after was; if it took that long to get me out when I was only 20 minutes into a cave, I dread to think how long it would take and how painful it would be to be rescued from the depths of the Dachstein. It was an effective lesson into how important it is that we stay safe on these epic adventures. If anybody wants to get involved then the only prerequisites are that you be a team player (prima donna cave diver types will need to wind their necks in!! ), are willing to get involved with the communal tasks (cooking, tidying up, prospecting for new caves etc..), and try to at least pretend to be cheerful!! As far as abilities/experience goes then yes, to push the deeper parts of these caves does require a high level of fitness/vertical skills but we have an entire mountain range to explore so all categories of caver will be useful for the greater good. Plus this year we’ll be there for a month so that’s plenty of time for the inexperienced to step up & do what’s required to get in on the action. In short, we were, are, and always will be a very welcoming Expedition project & many of today’s serious explorers on the Expedition scene cut their teeth in the Dachstein. We do most of our organising via Facebook for convenience (although some of the key players avoid social media) so the first stage is to join the Group (Dachstein (Austria) Caving Expeditions) & from there join the 2018 Facebook Event. We also have an Instagram page (dachstein_caving_expeditions) or just message us via UK Caving. 2 Likes Badlad and Buford like this. Apologies to our sponsors for the lack of updates on UK Caving: no real excuse beyond my own incompetence! I would like to take this opportunity to confirm the rumours: we finally made & confirmed the connection between WUG (Wot U Got Pot) & the Wadiland extensions beyond the sumps in the west of the Hirlatzhöhle. This is now the 9th deepest & 19th longest (I think) in the world at -1,560m & 113km long. Once the dust settles we will post more details on here but currently the lifers are travelling across Europe & are hoping to be able to cobble some sort of presentation together for Hidden Earth this Sunday. Many thanks to Tim, Jane, Spanset & everyone else for your support & sponsorship: it makes a huge difference to these self-funded projects. And for those of you who have played any part in the expeditions over the last half a century: the needle in the haystack was actually there all the time & you are all invited to the Wiesberghaus in 2019 for a celebratory Zipfer! 11 Likes Judi Durber, Huge, Scud, Emsy, steviet_scg and 6 more people like this. A brilliant achievement: one of the greatest in the history of British caving. So much effort by so many, over so many years, and in some of the planet's toughest, coldest caves. Congratulations to all the generations of explorers who have made this possible, not only in the many pots that have been pushed high in the mountains, but also in the Hirlatz. This is a connection that will live long in the annals of speleology. 1 Like Emsy likes this.